For my first rural field visit this time around, my field advisor (and previous professor when I was here with the China Center), Liu Wei, offered me the opportunity to tag along with this year’s class of China Center students on their 1-day excursion to the village of ShiMen (石门村), situated about three hours through the mountains on bus from Hangzhou. As one of the richest provinces in China (#5 according to the Global Times), Zhejiang is the only one with a road that reaches every village. After about two hours drive we began weaving around what is called “1,000 Islands Lake”, the largest man-made lake in China. While originally constructed as a hydro-electric project, employment through the lake’s tourism now surpasses hydro-electric employment. During an interview later that afternoon we would hear more about the tumultuous history of the lake’s impact on the local population. That’s Mrs. Yu on the right. Once we had made our way past the lake, our bus rendezvoused with a black sedan that Liu Wei explained contained our liaisons to the village: Mrs. Yu, a former student of his, who is now the head of the Communist Youth League at the county level, meaning she oversees the youth activities for about 200,000 people from ages 14-28. You can sort of imagine the Youth League as parallel to the Boy/Girl Scouts, but with a political undercurrent because Youth League membership means you have a better chance of Chinese Communist Party (CCP) membership. Her husband, Mr. Yu, is Vice Mayor of a neighboring township. Liu Wei said that they decided to introduce us to ShiMen village because 1) he told them he wanted them to show us a ‘regular village’ and not one of the ‘model villages’ that are often showcased to visitors because of new development or policies being implemented, and 2) this village serves as a ‘liaison’ between her office and the broader local population. 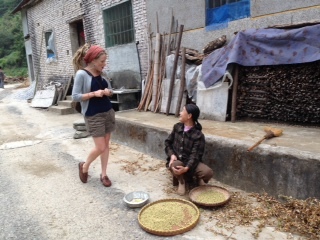 Upon arrival at ShiMen we were all properly introduced, and Liu Wei explained to Mr. Yu that I was his graduate student doing research on village-level implications of China’s rural land-use policies and development strategies. Mr. Yu said that prior to his current position as the township vice-mayor he also used to work in the financial department, so he knows a lot about village management. He invited me to come back for a week in November when a village within his township will be having local elections. As you can probably imagine I was thrilled and jumped at the opportunity. Village Committee (VC) elections are super fascinating because they were first formed (in two Guanxi counties in late 1980-early 1981) without the knowledge of local officials. When word eventually reached Beijing, the vice-chairman of the the National People’s Congress Standing Committee (NPCSC), Peng Zhen, praised them as “the perfect vehicle for practicing grassroots democracy.” Although local democratic elections probably seem counter-intuitive for an authoritarian government, Peng Zhen saw them as a tool necessary for tightening the Party’s rule in areas where its power was ambiguous. Despite heated debate, in 1987 a trial law was passed and the Ministry of Civil Affairs was entrusted with ensuring its implementation. While the elections are still subject to manipulation (VC members are elected from a slate of candidates that is decided by local officials), rural villagers have still recognized the elections as a tool to remove corrupt and incompetent cadres from power (rather than as a method to elect exactly who they want into power), and they have been vital to ensure proper local policy implementation. So they’re a fantastic example of how China’s policy development does not follow a strict top-down chain of command, but rural villagers have also initiated pivotal policy reforms. 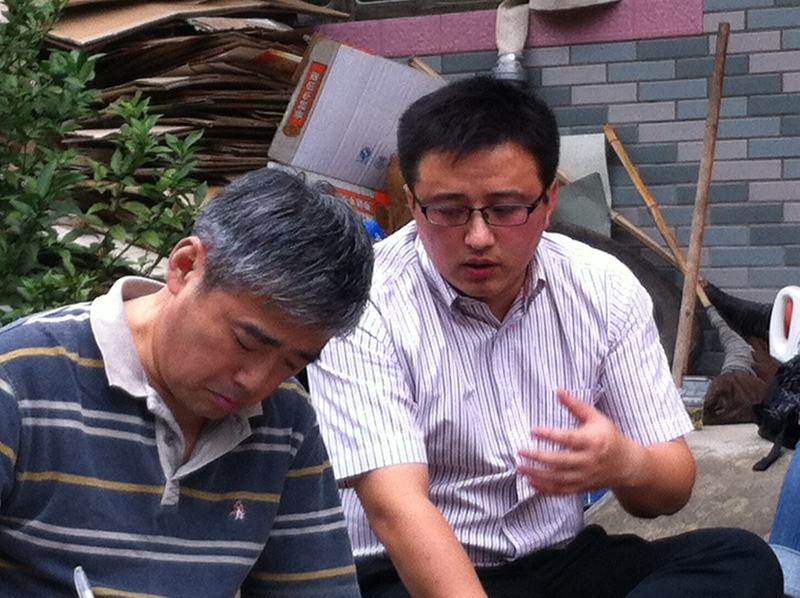 On the left is Liu Wei, my field advisor, and Mr. Yu, the vice-mayor of a neighboring township. The area has a long history – the county seat was established 1800 years ago. Because of poverty, the area is known for peasant uprisings, and more turmoil brings more poverty. The real turning point was in 1956 when the One Thousand Island reservoir was in construction. This demanded the removal of half of the county’s population: 300,000 people moved out to other regions and provinces, like the inland [and poorer] province Anhui, situated northwest of Zhejiang. The whole county was reshaped and restricted because of the huge reservoir. This was a big state project to provide electricity. There was some compensation, but not enough, under this system the local population had no way to act, they had to obey. Hangzhou as a prefecture, apart from the  urban districts, has five counties. This is the largest county in acreage because of terrain, and its inaccessibility. The road only reached every village very recently, this is the poorest [county] in economy. The county covers 4,427 square kilometers. It is very large, but arable land is limited: it is only 1/10th of this area, so people cannot live on agriculture. 70 percent is mountains while only 2 percent is water. 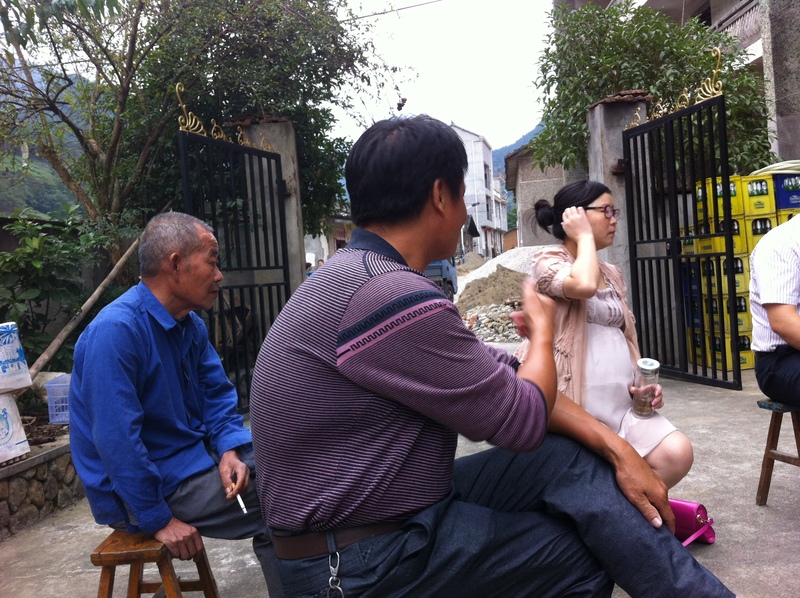 Out of the 450,000 population, 100,000 are working as migrant laborers in Hangzhou and it’s surrounding towns to send cash back to their families. The whole county has 23 townships and 425 villages. These are called ‘admin villages’. If you count natural villages it is 898, but some smaller villages come under the administration of one village council because you need a lot of people to form a council. The natural villages have been reduced by one-half. The largest town has a population of about 80-100,000 people, and 10-20,000 are a ‘floating’ population. The floating population is no longer illegal. The backwardness of the economy was caused by the building of the dam– it blocked the traditional waterways leading to the sea… it put the economy of the county back by about 20-30 years. The construction was completed in 1959, but it was not until 1979 that the economy started to boom again. 20 years here were lost. It took 20 years to restore the economy at the level of 1959, and even today the economy hasn’t fully recovered because of environmental protections put in place. Pollution is not allowed, so it hinders local growth. 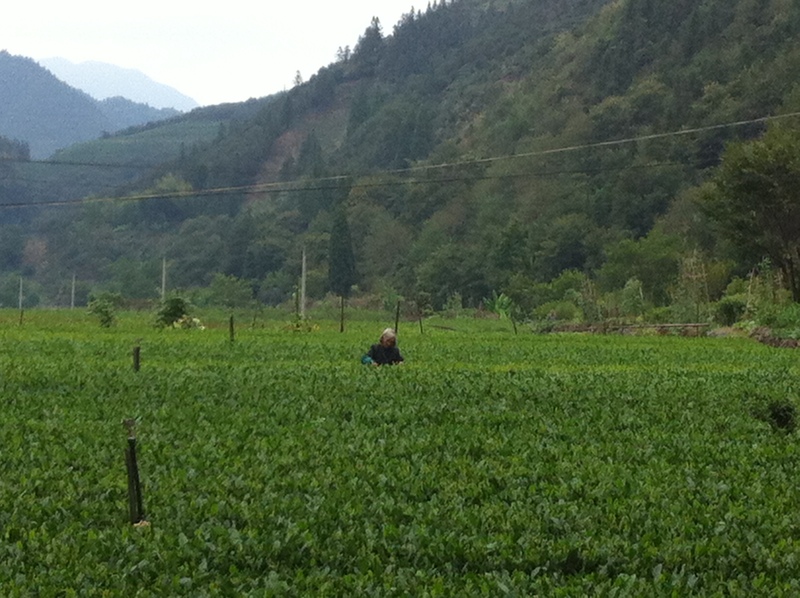 A local woman picking tea. Agriculture is still the main economy: tea, fruit, vegetables, and silkworm. It used to be forestry, but that has also been stopped because of protection of the water source for Shanghai and Hangzhou. Much of the development here is limited, but tourism has built up, along with the production of a popular brand of bottled water (Nongfu) and beer. But these can only produce so much. The population is growing, but the economy grows slowly. Forestry is a highly polluting industry, [and regulating it] is why we still have clean water, clean food, but this is also a sacrifice for the local populace. The present [central] government is new, especially the prime minister, who has been advocating a policy of urbanization. The village people are mainly elderly, while the able-bodied are working in towns to earn money. According to local government policy, new areas of townships have been built to encourage people to move from remote areas for free: they get compensation for moving out of villages, with little cost added to living in small townships. We hope in a number of years those people who have not been able to benefit from development will be able to by living in these areas close to townships. I later asked what is happening to the villages these people are leaving behind, and he said they are just abandoned. He also said the government has a policy to promote commercial farming and discourage private farming because of its low marketability. It was only older residents and a few small children that we saw in the village. There used to be a school in the village, but it closed a few years ago so the children have to board at the school in a neighboring town. Furthermore, he continued, the “aging society” is a serious concern for governance of rural communities: there are hardly any young people around so the governing of village life has been weakened. Education is also weakened by lack of parental care. The grandparents will take care of the kids while the parents are away [working], so the family structure is changing in a negative way. The market drives the young labor force out of the village and into the township. This is a serious problem to tackle. Moving on to the topic of the healthcare and pension system in the region, Mr. Yu said that both Beijing [the central government] and Hangzhou have been directing public financial resources into the healthcare and pension plans. Rural individuals pay in 100 Yuan/year [$16] while the government puts in 400 Yuan/year [$65], so in total they have 500 Yuan/year [$82] for healthcare. On average, this means 70 percent of their healthcare costs are covered by the project. This is a huge improvement over the last decade, but only in this region is this in place because it is one of the richest in the area. 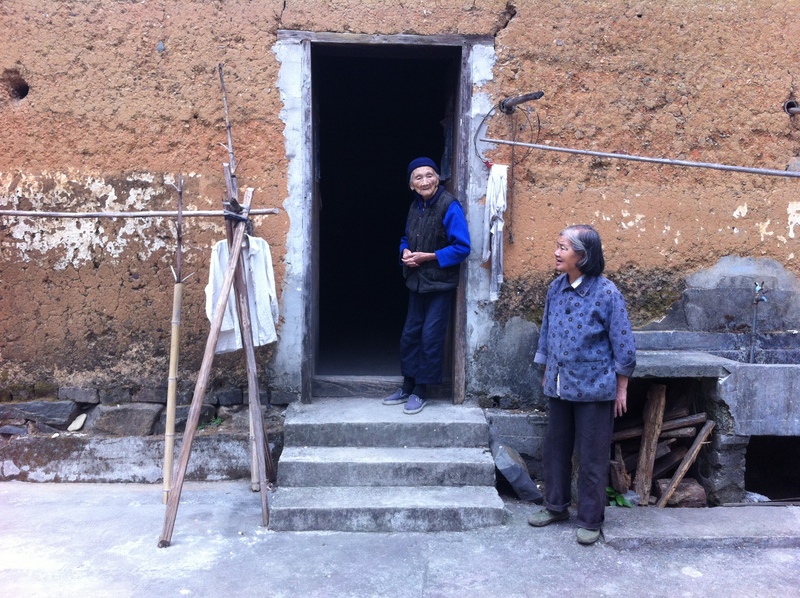 The government also provides a 100 Yuan food subsidy for people over 60 years, so they can cover basic food costs, like 30 kilograms of rice, and they are encouraging families to start Bed and Breakfasts to attract tourism. 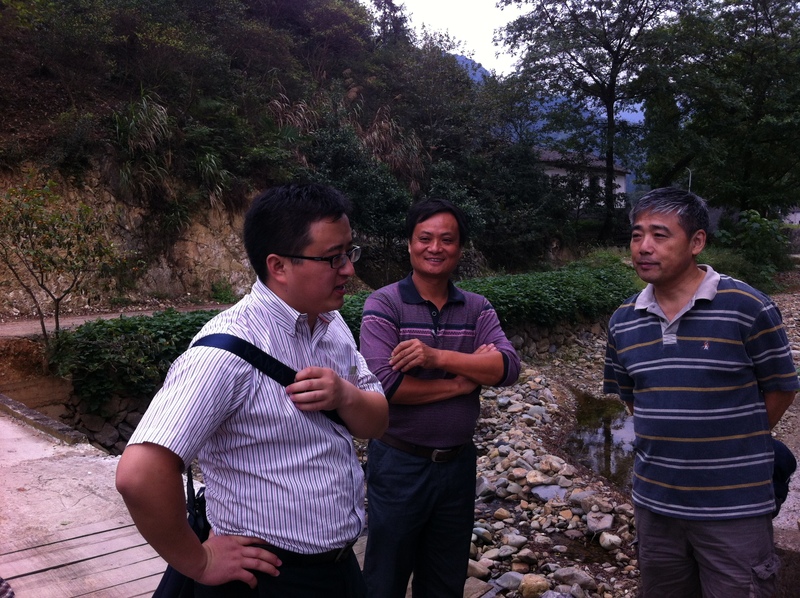 That’s Mr. Yue in the middle, with Mr. Yu on the left and Liu Wei on the right. Next, Mr. Yue, who is the head of the local Village Council (VC), introduced himself and gave us the village-level perspective (Liu Wei again translated). The village is governed by two councils – the Communist Party Branch, which has twenty Party advisors, and the VC, which he serves on. The VC is elected from a slate of candidates by the local residents; the slate is determined based on the size of the local population. The Council members serve for three years, and all receive a small salary; the amount of their income depends on the number of villagers. 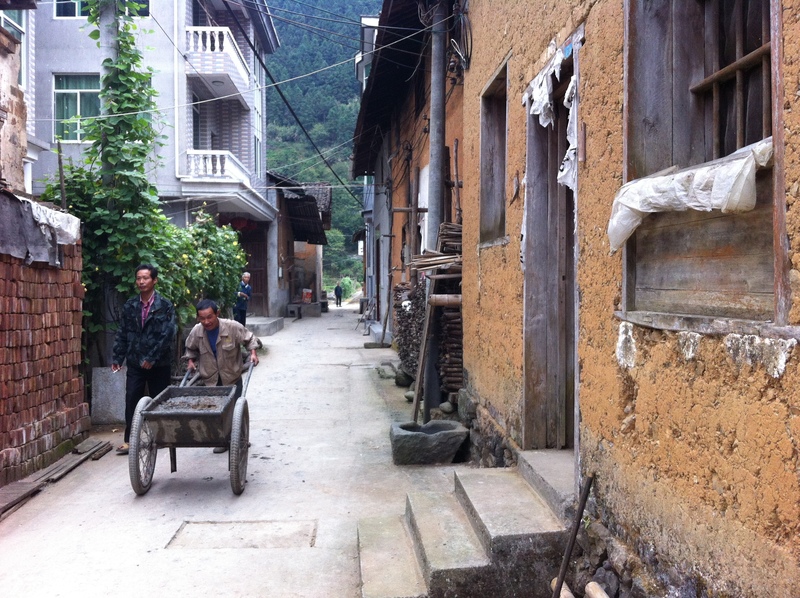 If there are 500+ villagers, each member will receive 900 Yuan/month. Each Council member also has their own farm. Here’s a view of the village from the tea fields. The village population is 6,978. Arable land is only 248 acres, and there are only three people for one acre of land, which is not much. There are 28,000 acres of forestry. 2/3rd of this are untouchable for protection of the water source, but 11,000 acres can be developed for bamboo, tea, fruit, and vegetables, and can sell these at the market in Hangzhou and Shanghai. In Hangzhou, per capita income is about $6,000 a year, while in the village people earn about $1,100 year, but they also grow most of their own food. When asked what is most difficult about his job, and what he likes the most, Mr. Yue responded that arbitrating is the most difficult. When neighbors/family members have a problem, the city leadership is supposed to sort the problems out, but usually they are not welcome in the village. In regards to what he likes the most, he responded that every community needs leadership; it is satisfying that he can provide this service. Mr. Yu added that the government provides financial aid to the local village, and the village leaders can access this aid and help direct resources where they are needed. 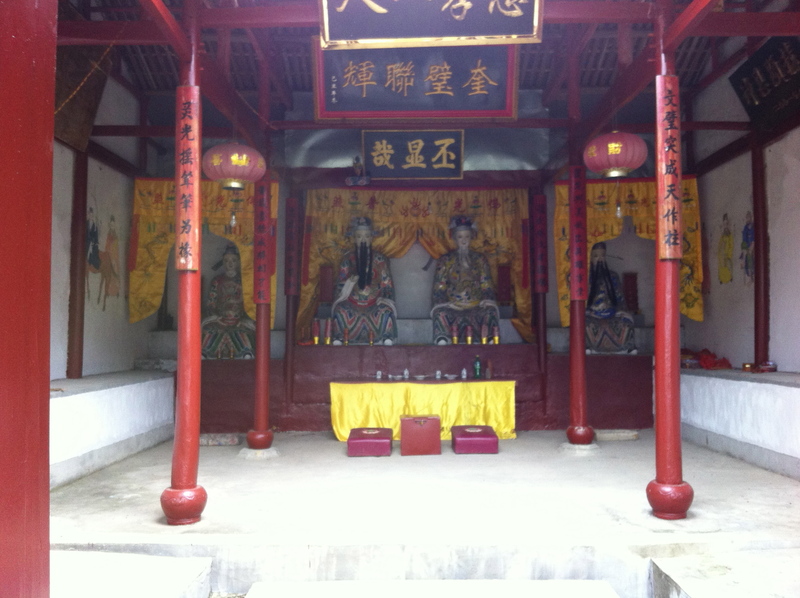 The alter to honor the ‘land gods’. After taking a tour around the village to meet some of the families and see the tea fields, we walked down the road to see where they have built something like an alter to honor the ‘land gods’. Liu Wei explained that while most of China is agnostic or atheist (proselytizing is actually illegal, and you must be an atheist to join the Communist Party), every village will have something like an alter to honor the land gods. Ok that’s all for this week! This coming week is a holiday for China’s ‘National Day’, so I’ll be heading to a farm in Liangzhu not too far outside Hangzhou from October 1st to the 5th, more to come on that soon! 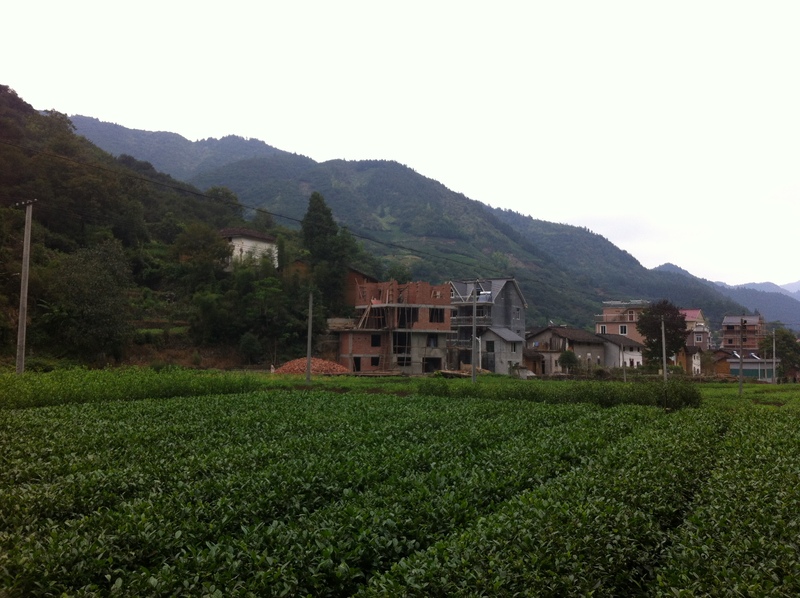 This entry was posted in Zhejiang Province and tagged rural China, rural land-use, tea farming, Zhejiang. Bookmark the permalink.